‘Bread with toppings’ has been around for thousands of years in various forms, but the food we recognise today as pizza came to the fore just a couple of hundred years ago in Naples, Italy. It wasn’t, however, until the Second World War that American troops stationed in Italy got a taste for the local speciality. They liked it so much, that once they returned to America, chains of pizza restaurants started popping up to cater for the new demand. Over the next few decades, pizza evolved into one of the most popular fast foods around, not only in America, but all over the world. Today, if you take a walk down any high street pretty much anywhere, the chances are you will find somebody selling takeaway pizza. Sadly, rather like the burger, pizza often gets a bad press. Often poorly made, and laden with fatty processed foods, what was once a tasty and nourishing meal is now dismissed as unhealthy junk food. Well, in this challenge, we are going to make dispel those notions. We’re going to make proper pizza. This pizza should have a thin base (no deep pan here), which once cooked shouldn’t be too crisp – it should remain pliable with a pleasant chewy texture. It should have a tomato sauce spread thinly over the surface, and then slices of mozzarella cheese on top. Modern pizza bases are most often made with commercial yeast. Of course, it hasn’t always been that way, throughout most of history, we’ve used natural yeasts to make our leavened breads. Our pizza is not going to be made with any commercial yeasts. I happen to know that Anya has a sourdough starter at home (I know this, because I gave it to her, and I don’t think she has managed to kill it yet), so I want her to make a sourdough pizza base. The tomato sauce, she should, of course, make herself, although I’ll leave the exact recipe for her to choose. Finally, the mozzarella – unpasteurised buffalo mozzarella is the preferred choice. I’m not going to be overly purist here – I’ve listed above the fundamental parts, a well made pizza needs only these – but additional toppings are acceptable if Anya deems them to be appropriate. 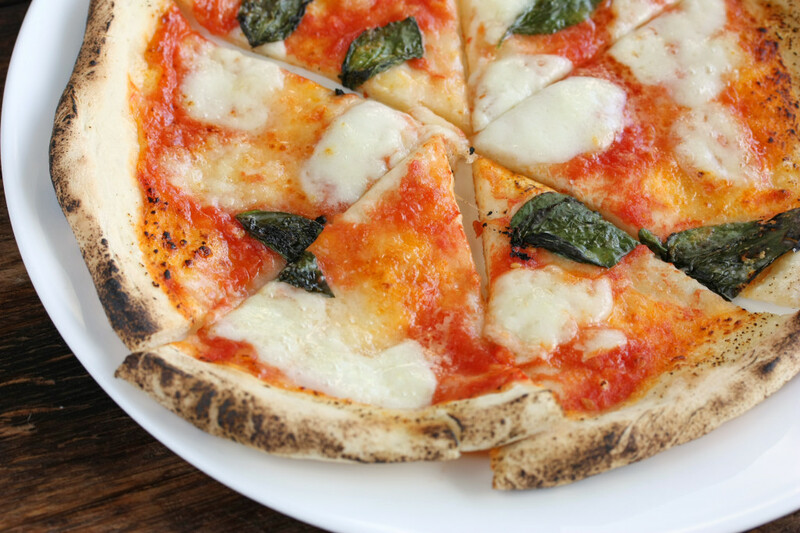 The best pizzas are cooked at in wood-fired oven at temperature of around 485° C/905˚F. Most of us don’t have ovens like that in our kitchens, so we have to make do with the lowly domestic oven. Turning the temperature up high and using baking stone or heavy baking sheet produces pretty good results. Make a pizza with a sourdough base, a home-made tomato sauce and mozzarella. Additional toppings may be added at your discretion. The burger was a success. And after a couple of days sitting in the fridge, they got better and better. Anya did seem to be chopping meat for a very long time, though. Looking forward to the pizza this evening. Being brought up in the Staffordshire countryside, the only pizza I got as a kid was of the frozen supermarket variety, often left in the oven too long by mother. So I still consider a good pizza a real treat.